The chart below shows current Greek liabilities to the official sector. Note that if you add in the liabilities to the private sector outside of Greece (such as €130 billion of Greek banks' liabilities to other nations in the Eurozone, new Greek bonds held outside of Greece, debt of corporations and households held by non-Greek banks, etc. ), the number will easily exceed half a trillion euros (discussed here). 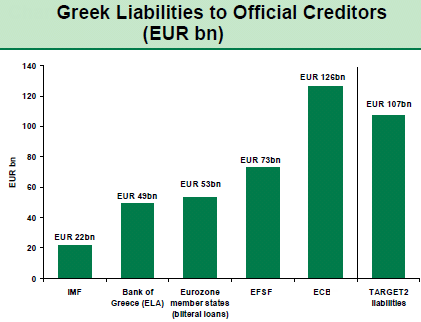 Greece will either convert these liabilities to drachmas or simply default on them - there is no other choice. The ELA lending by the Bank of Greece is now increasing as the ECB halts the authorization to lend to some Greek banks. Therefore the only way to fund these banks is via these emergency measures (ELA). Bloomberg/BW: - The Frankfurt-based ECB said yesterday it will push the responsibility for lending to some Greek financial institutions onto the Greek central bank until they have sufficiently boosted their capital. “Once the recapitalization process is finalized, and we expect this to be finalized soon, the banks will regain access to standard Eurosystem refinancing operations,” the ECB said in an emailed statement. Where does the Bank of Greece get the funds to increase the ELA lending? It simply taps the Eurosystem via TARGET2. Many point out that the Bank of Greece lending to the banking system is collateralized and the ECB will be able to recover these funds. But the ELA collateral is of poor quality and will certainly become worthless under a devaluation scenario. Furthermore it is not clear if the Bank of Greece would even release the collateral it holds on behalf of the ECB. As time goes by, Greek external liabilities will continue to grow, making it increasingly more expensive for the Eurozone to exit. 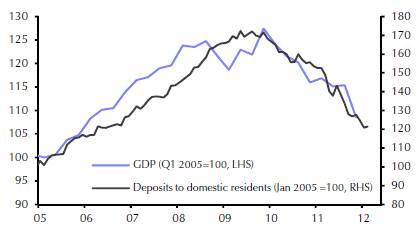 And as expectations of an eventual exit increase, so does the run on the Greek banking system and further need for ELA. Capital Economics: - On the basis that a new drachma (reportedly already being planned by currencyproducer De La Rue!) will depreciate sharply against the euro after introduction, there is a clear incentive for Greek residents to maintain their wealth in euros until after that depreciation. The simplest way to do that is to transfer it to overseas banks or even just stash it under the mattress. BNP Paribas is assigning roughly a 50% probability that the upcoming election will reject the austerity requirements, setting the stage for Greece exiting the euro area. BNP Paribas: - It is very difficult to forecast how Greeks will vote second time around, but the country has two main options: accept austerity and stay in the eurozone, or reject austerity and perhaps leave the single currency. We believe that these two options are equally probable at the moment. At the moment the Eurozone can hardly afford such a massive hit to its institutions and the private sector. It may not have much choice however. And time is not on Eurozone's side as Greek liabilities keep increasing. Denying this possibility (which many European officials have done) is not going to make the problem go away. Furthermore if the exit turns out to be a positive for the Greek people (which many believe will be the case over time), it will set a blueprint for other periphery nations' potential exit. This will be particularly costly for Germany, given that the nation is the largest "shareholder" of the "official creditors" in the Eurozone (ECB, EFSF). If the Germans thought that the integration of East Germany was expensive, it will pale in comparison to what a contraction of the euro area will end up costing them.